Has the housing market bottomed? 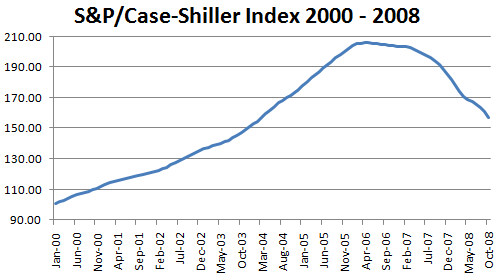 It doesn’t look like so, at least not from what we can see from the S&P/Case-Shiller Index. Standard & Poors today leased its S&P/Case-Shiller Home Price Index for October 2008 which shows a 18% plunge of U.S. residential home prices in the past 12 months. The index has fallen every month since January 2007. Of the 20 metropolitan regions across the index tracks, Phoenix, AZ showed the most decline in home value year-over-year at 32.66%, followed by Las Vegas, NV 31.70% and San Francisco, CA 31%. The smallest drop occurred in Dallas, TX, where home prices were down only 3.04% over the past 12-month period, followed by Charlotte, NC 4.42%and Boston, MA 5.99%. If you are planing to buy a house, is now a good time to buy? Or you want to wait a little longer. Prices of Gold Coins: How are They Determined?